It's sometimes difficult to imagine Hollywood stars as being "normal" parents. Yet, for the most part, they are. Just doing what most parents do when there are children to raise. 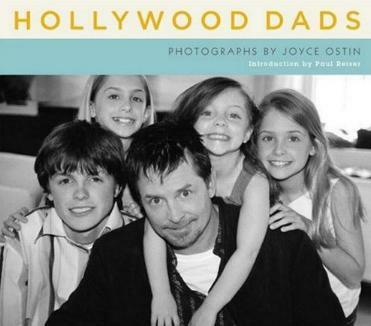 Hollywood Dads is an intimate portrait of some well-known dads with their children. Photographer Joyce Ostin has put together this collection of fifty fathers and their offspring - from David Duchovny to Stanley Tucci to Ozzy Osbourne and Laird Hamilton, among others. A dizzying array of dads in the spotlight, some offering a few words, others not. In most of the black and white photographs, you can see the joy in the fathers' eyes and the love and pride in the childrens'. I loved John Leguizamo's intelligent and responsible parenting comments, as did I of Mekhi Phifer (very sensible and mature words). The Willis/Kutcher family photo is a superb example to the rest of the world - BRAVO! The entertaining and eloquent funnyman/father Paul Reiser wrote the Introduction: his moving take on being a father. My favorite photos are of Eric McCormack and his son Finnegan, and Charlotte McDermott (what a cutie!). What a goodlooking family the Fox family on the cover is. Their eyes all jumped out at me, and their smiles are delightful. Ms. Ostin, I wish you much good luck with your fundraising for cancer research. Conclusion - A poignant look at famous fathers that we rarely see. Do check out Joyce's first book, Hollywood Moms, in which she features evocative photos of, among others, Hilary and Judy Swank, the Pfeiffer ladies, Jada Pinkett Smith and her mom Adrienne Banfield Jones, Dyan Cannon and her "twin," daughter Jennifer Grant, Penny Marshall and Tracy Reiner, Sheryl and Bernice Crow, Sela Ward and Annabella Ray, and Goldie Hawn and Kate Hudson. Conclusion - A great collection of mothers and daughters.